What Alison Mosshart and Jack White ultimately share is the idea that rock’n’roll means great sound effects above all else. The guitars they adorn their hi-tech, swamp-blues alt-rock with can be described metaphorically as power-drilling or machine-gunning; they can also be described as literally sounding like a power drill or machine gun. Thus no one would ever describe their microtone-heavy bluster as some kind of relic or return; there’s no garage in it à la the mechanistic Black Keys, nor any grease à la the song-impaired Alabama Shakes. Dead Weather songs like the previous “Bone House” had wall-scraping Tom Morello moves, but here they divebomb deeper into split octaves and distend their waveforms into grotesque disfigurement. Is it a six-string or a 6.0 jobber length? White’s drumming is — sorry, Meg — surprisingly Bonham-esque, Mosshart moans through a forcefield of pixelated dirt, and Dean Fertita’s electric-toothbrush-esque leads on axe and keyboard cut through the Velcro distortion for an unusual synthesis of thick and clear. The Electro-Harmonix brand POG2 Generator pedal — the one that typifies White- and White-related guitar noise — from “Blue Orchid” onward has only existed for ten years, lest you mishandle the term “throwback.” The future can be scuzzy too; for one very computerized minute of “Three Dollar Hat,” these amp-attackers even sound like a Kraftwerk record being run through a paper shredder. 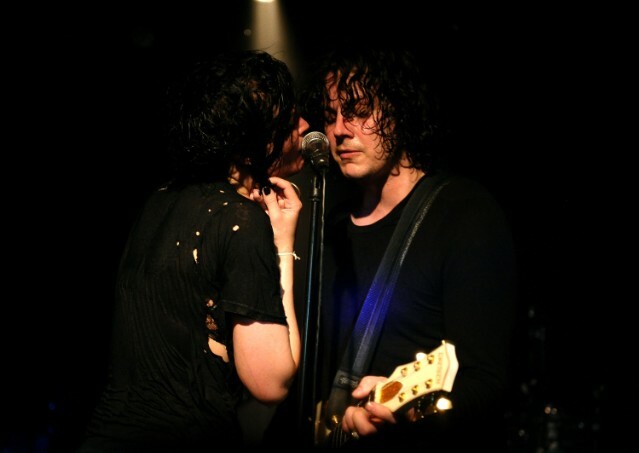 But Dodge and Burn is where those dismissing Jack White’s Third Band as another project have to confront their (understandable) phobia of “rock’s Willy Wonka” that’s set in over the 2010s. For all of Lazaretto’s unwarranted excess, the superfluous Raconteurs defined by Brendan Benson’s mediocrity and White’s own annoying blubbering to the press, it’s his best album since the White Stripes. Which is yes, a dangerous, Stones- or Bowie-esque game that critics may be playing for the rest of his career. Note these factors though: The Dead Weather is not a “side” project for Mosshart, who’s only made one Kills album (2011’s skinny Blood Pressures) since the Dead Weather’s 2009’s Horehound and 2010 Sea of Cowards became her only Billboard top-ten albums to date. There is every reason to believe Dodge and Burn, almost unbeknownst to us Japandroids and Deerhunter types, will be the biggest album of her career. Part of that is songs, which in this skill set equal riffs plus performances: the barbed-wire sting of “I Feel Love (Every Million Miles)” and the descending root canal in the chorus of “Buzzkill(er)” open the album with impossible expectations for whatever barely dynamic competition the quartet has in 2015. They carry through with the broken-Donkey Kong crunch of “Let Me Through” and the menacing side-to-side needles of “Be Still.” There’s also an identity: where the strong Horehound and Cowards sounded interchangeably enough like other White projects, Dodge mostly does not. Sometimes, as on “Three Dollar Hat” or the ?uestlove-esque breakbeats of “Mile Markers,” White’s decision to give his drums a thin, dubby pong-tone makes them sound unintentionally hilarious, like 311 stopped in for a few bars. But unless an overreaction to rockism has led you to deem the varying riffage “samey,” there’s little to complain about 12 songs in 43 minutes by icons of varying likability. This band is less celebrated for their lyrics, despite a catalog of nuggets as rich as “I’m just like your mother” and “Shake your hips like battleships.” On Dodge, Mosshart’s “I save all my best shots for you / Boom boom boom” as the gender-bending “bad man” of “Let Me Through,” or White Beastie-rapping “I got three young kids and a badass wife,” on “Three Dollar Hat,” are all richer rock star bulls–t theater than anything you remember from Josh Homme or Dave Grohl lately. When she and Jack sing “Don’t make me run” in unison on “Rough Detective,” it’s hard to tell who’s threatening who, and the ocean of sparks in the surrounding roil makes Mosshart’s every howl sound like it’s echoing off the inside of a whale’s belly. And then there’s the closing “Impossible Winner,” a piano-and-chamber-accompaniment ballad suited to Sia or Adele that shares a chord progression with — haha — the Black Eyed Peas’ “Where Is the Love?” at parts. “I’m a white noise song thrown upon a thorn,” sings Mosshart, over the Dead Weather song that least fits that description. If nothing else it’s a plea to not take her for granted. She is the impossible winner, and the star of an outfit whose members are hardly content to rest on their past achievements. Dodge and Burn is one of their greatest.